If you're looking for the best energy efficient refrigerator, you're in luck. The United States government has done most of the hard work for you. If you want to save energy and are in the market for a new refrigerator or other appliance, just making a change will probably net you additional savings. With the advent of stricter federal guidelines for appliance manufacturers and increased interest in energy conservation, almost anything on the market is likely to be a better bet than anything you have owned for five or more years. New refrigerators have improved insulation and use more efficient compressors that will save you money at the end of the month when the electric bill shows up in your mailbox. When you shop, look for Energy Star qualified refrigerators. Energy Star, a joint program conducted by EPA (Environmental Protection Agency) and the United States Department of Energy, promotes energy conservation, energy aware manufacturing and energy smart consumer spending by rating the products you buy. To qualify for an Energy Star rating, refrigerators must be 20 percent more efficient than non-rated brands. In dollars and cents, looking for the Energy Star logo when you shop will result in an energy savings to you of at least $165 over the life of your refrigerator. That's just when choosing one model over another. When you change-out a refrigerator from the 1970s for a new model, you could net an energy savings of as much as $200 a year by opting for updated equipment. You'll not only save money, but also help the environment. The energy required to run older appliances contributes to greenhouse gases being emitted into the environment. There are a couple of other things to consider. Your refrigerator is one of the hardest working and most expensive appliances in your home. If it's old, it may be running more inefficiently than the statistics suggest. Dirty condenser coils, a deteriorated or dirty door gasket or a location near a sunny window or hot stove can all contribute to additional energy waste. Top-freezer refrigerators: The traditional refrigerator from the 1970s and before is the top-freezer style. It's between 30 and 33 inches wide with an approximate 22-cubic-foot capacity. This type of refrigerator has the advantage of being the least expensive style available. Bottom-freezer refrigerators: Sales of bottom-freezers are growing the fastest. Running from 30 to 36 inches wide, bottom-freezer refrigerators can have up to 26-cubic feet of storage. Since the cold box and not the freezer is at eye level, bottom-freezers make for less stooping. 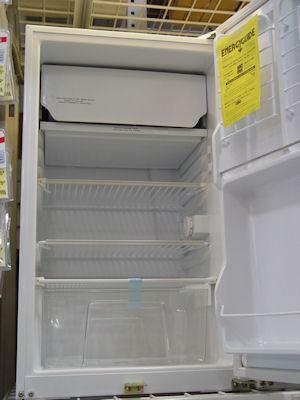 Side-by-side refrigerators: With the freezer on one side and refrigerator on the other, this style of refrigerator has easy access to some sections of both the freezer and the cold box. These units are also the most likely for nice add-ons like a through the door water and ice dispenser. Measuring 32 to 36 inches these units claim a storage capacity of about 30-cubic feet, but that figure can be deceptive. Only about 70 percent is useful space. If having enough room to open a standard width refrigerator door is a problem,then a side-by-side is an elegant solution. One drawback is the limited width in the cold box, which may impact the overall efficiency of the unit. A refrigerator runs most efficiently when it's full, but a narrower design can make storing some items challenging. Built-in refrigerators: These days you can find any number of built-in, reach-in and other specialty refrigerators to serve your needs. Among the most popular choices are shallow refrigerators designed to sit flush with your cabinets and even fit behind specially designed cabinet doors. When it comes to the best energy efficient refrigerator, there are many options to choose from. Be sure to choose a model that is Energy Star rated when purchasing a new unit.